Scrambling to plot an orderly path out of the Brexit maze just days before the United Kingdom is due to leave, May rushed to Strasbourg on Monday to secure “legally binding” assurances from European Commission President Jean-Claude Juncker. British lawmakers, who on Jan. 15 voted 432-202 against her deal, were on Tuesday studying the assurances with lawyers. The government’s top lawyer, Geoffrey Cox, is due to give his opinion on Tuesday ahead of the vote due around 3 p.m. ET. “It is this deal or Brexit might not happen at all,” he said. Sterling rose 1.5 per cent against the U.S. dollar and to a near two-year high against the euro. 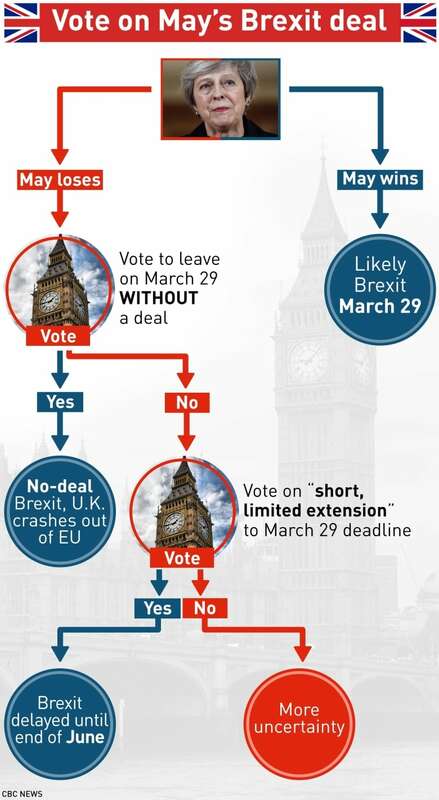 Britain’s labyrinthine crisis over EU membership is approaching its finale with an array of possible outcomes, including a delay, a last-minute deal, a no-deal Brexit, a snap election or even another referendum. May announced three documents – a joint instrument, a joint statement and a unilateral declaration – which she said were aimed at addressing the Irish backstop, the most contentious part of the divorce deal she agreed with the EU in November.